You know it will be an interesting ride when the guy at the local bike shop tells you that you probably shouldn’t try riding up the road with anything less than a mountain bike. When you tell him that you’re planning to ride it with some touring bikes, he shakes his head as if to say, “it’s your funeral” and goes back to changing the brake cable on the bike in the stand. Our first encounter with Refugio at 2008. Albatross bars, CETMA rack and no idea what we were in for. 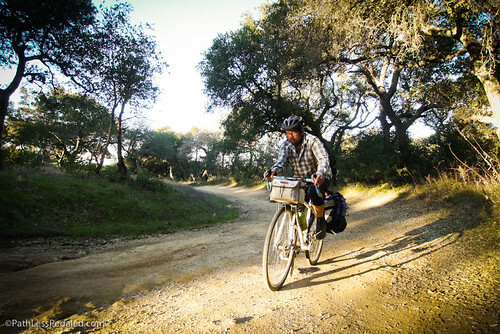 For almost as long as we’ve been touring, Refugio has stood out in our minds as one of the toughest rides we ever did. 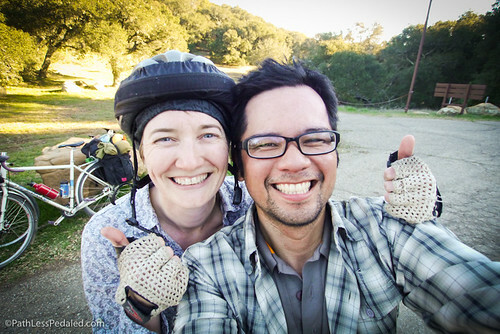 We first “rode” it almost five years ago early in our touring careers. 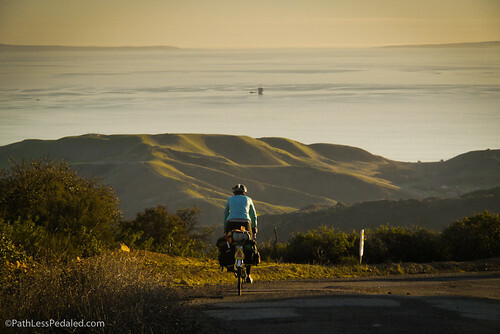 It was recommended to us by a friend as a scenic way to get from Solvang to the coast. There is of course a little matter of a mountain range in the way. Refugio before the unpaved climb is actually quite pleasant with rolling hills. You connect to Refugio a few miles out of Solvang off the 246. When you first encounter it, the road is downright pleasant. You pass a pastoral landscape of vineyards, farmland and undulating green hills. You even cross a small creek at one point at a peaceful and shaded bridge. Its not unlike riding through a Wordsworth poem. But you can never get too comfortable, because you know in the back of your mind the idyllic landscape will transform into a rocky grueling ascent. So, enjoy it while it lasts. The moment of truth is unmistakable. 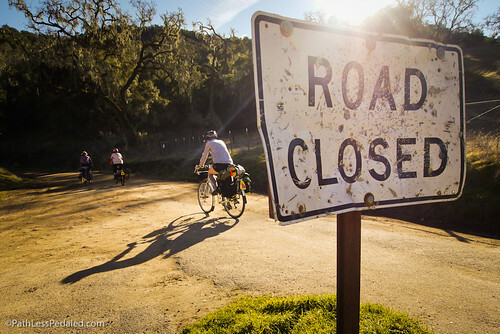 A foreboding concrete barricade and a bent Road Closed sign riddled with bullet holes is the demarcation between a pleasant Sunday road ride to the start of something completely different – dirt, gravel and ruts. 23mm tires need not apply, nor those that are afraid of having to push their bike for stretches. 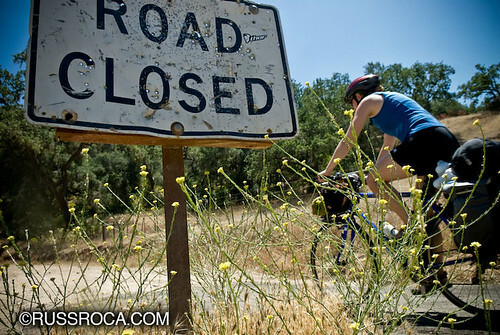 The bullet riddled Road Closed sign in 2008. The same Road Closed sign 5 years later. This time we brought some friends with us. Five years ago, this road owned us. It was the middle of summer, highs were in the 90s, the dirt and rock surface hadn’t seen a drop of rain in weeks. Loose mini boulders the size of a baby’s head were all over the place. I gave it my best effort that first mile but after I kept slipping and bouncing off my line I resorted to pushing, which with the steep grade and uneven surfaces wasn’t any easier. This is the road that made me quit clipless pedals becauuse I couldn’t clip in fast enough on the rough and steep terrain. 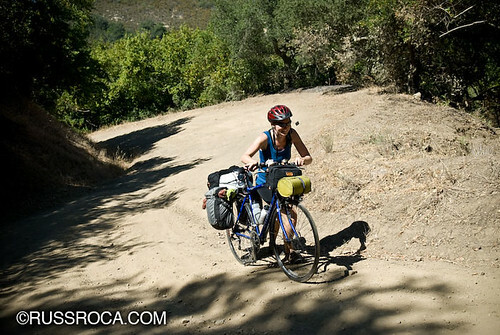 I remember hiking the bike about 70% of the time and Laura remembers distinctly the buzzards circling overhead and wondering how curious it was to spend her birthday pushing a bike up a mountain in sweltering heat. The only consolation was that the actual climbing was only 3 miles long and it had to end at some point. I can remember the feeling of being absolutely wrecked by the time we reached the top, cursing our friend who had recommended the road and vowing never to take his navigational advice ever again. 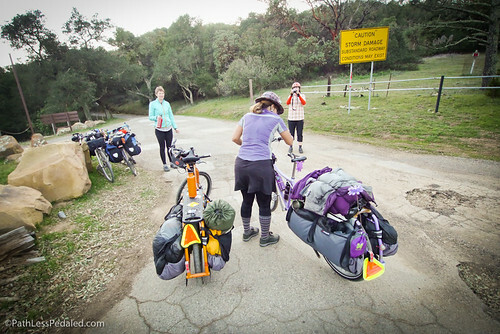 Our friend Cynthia and her fully loaded Big Dummy, wondering the same. 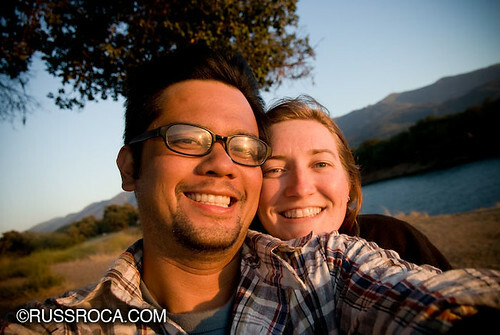 Flash forward a few years and a few thousand miles and we find ourselves once again at the bottom of Refugio. This time, conditions are in our favor. The weather is hovering at about 70 degrees and by the looks of the first half mile, the winter rains have helped to fill in the loose rocks with dirt. Still a tough climb, but we did more riding this time around and actually enjoyed it. That’s not to say its a walk in the park. Refugio averages 11%, meaning several pitches are easily 15% or higher. We shift down into our lowest gear, try to find our Zen centers and pedal upwards. And yet something remarkable happens during the ride, it doesn’t feel quite as impossibly hard as we had remembered it. Yes, we are moving slow, but we are moving without having to get off the bike and push. Our optimism is cautious because every turn reveals some other nasty steep gravel challenge, but each time we are able to pedal through. At about 2.5 miles into the climb, we know we are going to make it. The road keeps going upward, but it is just a formality. We’ve become stronger riders not just physically but mentally. 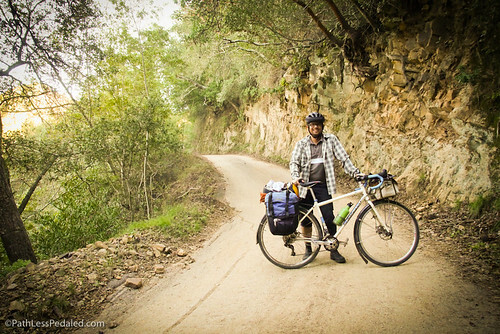 We’ve climbed longer and higher roads with heavier bikes and those experiences have given us perspective. When we reach the top we celebrate with some fresh oranges. Demonstrating the width of this so-called road. Tough but rideable this time around. When our friends who we were touring with reach the summit, we descend together. The sun is setting and Refugio, a road that has haunted us for years has never looked more beautiful than it does now. The air is startlingly crisp and we can see far out towards the Channel Islands which are bathed in warm light. That first memory of us dragging our bikes up the dirt hill years ago is overtaken with a new one of us soaring down a golden valley in the cool evening, laughing at the joy of it all and in the knowledge that some things are better the second time around. All smiles at the summit. A rare clear day on the coast. Savoring the hard earned descent to the water. Although the coastal side is paved it is a screamer of a downhill. We all had to stop a few times to let our disc brakes cool! Happy we survived the first time. Just plain happy this time. Amazing views, awesome climb. You two are ageless. Cool story and very well written. Congrats. If your in San Diego come stay with me. Experience pays! 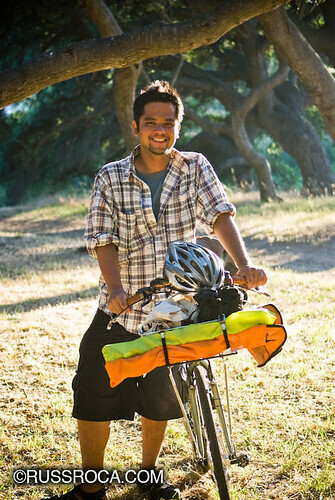 We’d love to have you do this as a slide show at Open Bike when you get back. Lot’s of love from PDX! that road is a hidden gem. Much nicer than 101 or San Marcos pass. Great story. Great photos. When I go day trekking in south-central Ontario I like to take backroads. While they are rougher, mostly unpaved, and the gradients can get crazy (when crossing Niagara Escarpment), they offer better views and almost no cars. Amusingly, Google directions routes you this way on foot but not on bicycle. Looks like a fabulous ride. The view from the summit looks like it is worth the climb, let alone the screaming descent. 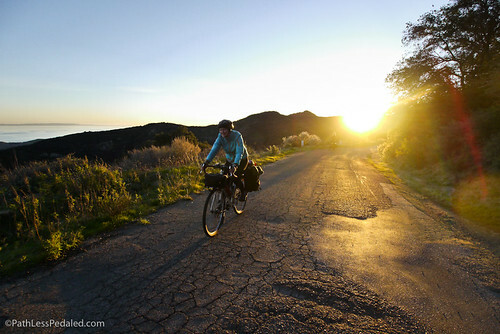 I visit Solvang each March for training, from Ohio and do that climb each time, on a road bike. 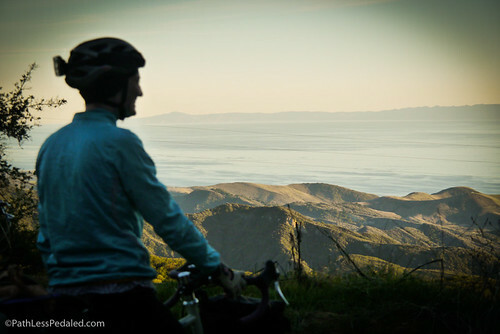 At the top, a turn to the left takes you up another 2000′ to a satellite array with spectacular views along a narrow spine of ridge, the ocean to one side, Santa Ynez Valley to the other. May be the best views I’ve seen from a bike. Regans old ranch is located up there but its since been acquired by a group. Heck of a place for a ranch. 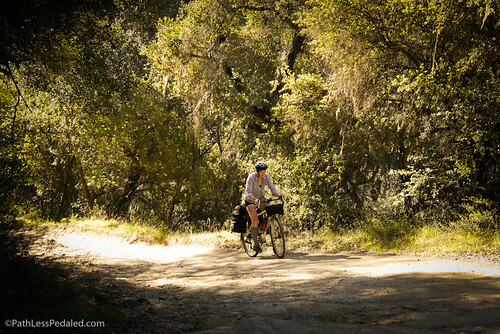 Refugio was bladed two years ago so it’s much better than when you rode it in 2008. Enjoyed your report. Way to go. I was cheering for you.